I'm sneaking in a make with the other team today for the new challenge at 613 Avenue Create! This week's optional twist is Shabby Chic. And I was able to work with one of our amazing sponsors: My Whimsical Little World and the adorable image "Splish, Splash". Because our twist this week was shabby chic, which tends to softer more muted tones, I chose to color my image in pencils rather than Copics. I did stray into some of the primary colors with her boot, umbrella, and skirt, but most of the image is softer. I used my Distress Paint Dauber in Picket Fence on my background paper. It's not super visible, but I loved the clouds and raindrops on the paper so I used the paint dauber to tone down the color and soften the pattern a bit. Once the card was put together, I went in with my Glossy Accents and left raindrops on the flowers and papers, as well as coating the puddle so that it had a nice shiny surface. Sara this is so beautiful. Loving the soft colouring and the clouds are so fun. Really cute card and the lace and pearls. Thanks for sharing over at Inspiration Destination. Thank you so much for joining in our first ever challenge over on the My Whimsical Little World Challenge Blog. What a wonderful card and I am so glad you have used one of our images. Lovely use of layering. I hope you will join us again for future monthly anything goes challenges, there are always wonderful images up for grabs. What a lovely card Sara...beautiful lace! Love your "raindrops". 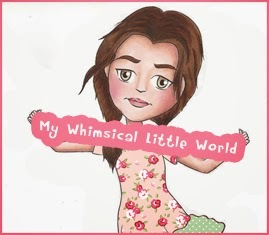 Thanks for joining us at My Whimsical Little World Challenge Blog for our first ever challenge. Hope to see you again next month! Thanks for playing along in the Design Team Showcase.